Sarah Hyland has been discharged from hospital after she spent five days in there because of her swollen face. The 'Modern Family' star was ''torn from work'' and forced to seek medical help earlier this week after her face ballooned and, after spending five days being watched by doctors, the 27-year-old actress was discharged on Saturday (23.06.18). A source told People.com: ''Sarah had a scare and was hospitalised. It was scary but thankfully she is better and is home. 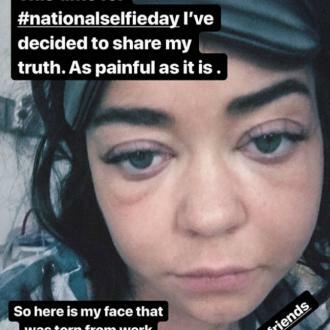 It's not known what caused Sarah's face to swell but she said on Thursday (21.06.18) that she wanted to share her ''truth'' with her fans - even though it was painful. Alongside a photograph of her puffed face, she wrote: ''Sometimes a selfie is more than just a good angle or feelin cute. This time for #nationalselfieday I've decided to share my truth. As painful as it is. The brunette beauty also shared a video of her dog licking her face, which had been filmed last weekend, shortly before she was taken to hospital.